Roll out your clay and cut out the shape of frame you would like (we used a ruler to help with the square frame). Dont forget to make the hole in the centre. 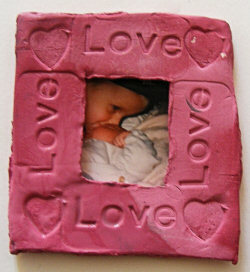 Press your rubber stamps into the clay so they leave an impression. Leave your frame to harden for a few days. Use double sided sticky tape to stick your photo to the back of the frame. Now cut a piece of card the same size as the frame and stick it on to the back with double sided tape. Finally glue a magnet on to the middle of the card if you like.